This is a special year in Normandy, where 9,387 Americans are buried at the American Cemetery, because June 6 will mark the 70th anniversary of the D-Day landings. There are 24 American military cemeteries, overseas where the remains of 125,000 U.S. soldiers are interred, and according to the American Battle Monuments Commission, which oversees American military cemeteries around the world, it is the most visited of all of them, receiving about one million visitors each year. The American Cemetery’s $30 million Visitor Center tells the story of D-Day with all of the dignity it commands. The Franco-American relationship in our narrow time has been something of a political football. In one particularly foul election, John Kerry (no stranger to military heroism) had his patriotism questioned because he is fluent in French. France, to its credit, has taken the relationship more seriously and nowhere is that more apparent than in the way France honors the memory of the battle and the way they tell the story of the D-Day landings, the most famous military beach landing in history. 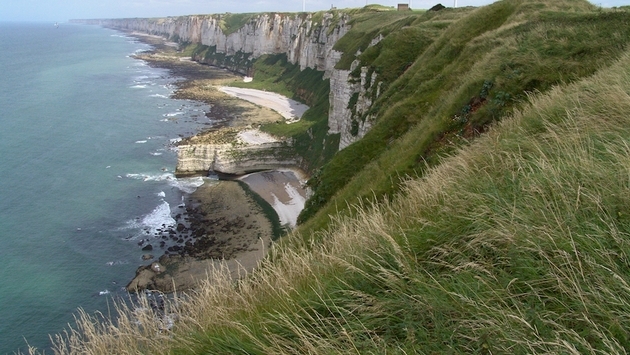 In 2012, French tourists made up 55 percent of the visitors to military sites at Normandy, about 3.5 million people. The remaining 45 percent (2.7 million) came mostly from Great Britain, Germany, Belgium, the Netherlands and the U.S. France has invested almost €50 million recently to polish up the battlefields, monuments and memory trails of both the First and Second World Wars. This year also marks the centennial of the beginning of WW1. On June 6th, Normandy will host a program of events and commemorations of the D-Day Landings and the Battle of Normandy. From spring to autumn there will be many events in the towns and villages of Normandy, from the Caen Memorial to the D-Day Landing Beaches. The program includes historical reconstructions, concerts, film screenings, firework displays, exhibitions, themed tours and guided walks. There are also many packages being offered by American tour operators. TourCrafters, for instance, is offering a seven-day package, from $1,659 per person land-only, based on four persons traveling together includes three nights in Paris and three nights in Bayeux with daily buffet breakfast, round-trip 1st-class train Paris-Bayeux, transfers and a tour of the D-Day Landing Beaches. Departures are daily through October. In Bayeux, the first French city to be liberated in June of 1944, passengers are picked up for a D-Day Tour of the American Sector, to visit Omaha Beach where the Americans landed, to see the site of the German gun battery at Pointe du Hoc (where Army Rangers scaled the 100-foot cliffs while being fired on by German machine gun emplacements. It goes onto the American Cemetery at Colleville-sur-Mer. There’s also free time in Bayeux, to stroll its medieval streets, tour its 11th-century cathedral, visit the Memorial Museum of the Battle of Normandy, and see the famed Bayeux Tapestry, a 230-foot embroidery that tells the story of William the Conqueror’s invasion of England. The three-star Hotel Churchill is located in the center of Bayeux. CroisiEurope’s Normandy excursion package is a day-long, optional excursion will be offered an add-on to its most popular river cruises in Normandy. The excursion will visit the five French beaches of Utah, Omaha, Gold, Juno and Sword. Prices to add this excursion to a CroisiEurope itinerary start at $130 per person and can be booked for select April to October 2014 itineraries. Normandy offers more to the visitor than D-Day monuments. Other attractions include the abbey of Mont-Saint-Michel, the Bayeux Tapestry , Le Havre, Tatihou and Saint-Vaast-la-Hougue and more.